Standing on the hill for nearly 900 years, Farnham Castle and the Keep is steeped in history. The Castle overlooks the historic town of Farnham and is now a unique venue for events, meetings and weddings. The impressive motte and shell keep of Farnham Castle was founded in 1138 by Bishop Henry of Blois. The accommodation in the keep was updated in the 1520s. The keep was abandoned after the Civil War. 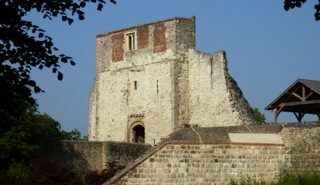 The keep is managed by Farnham Castle in partnership with English Heritage and is free of charge to visit. See the English Heritage website for more information on access and facilities. The Keep is open most weekdays (except over Christmas and New Year) from 9am to 5pm (or dusk, if earlier). The Keep is also open 10am to 4pm on Saturdays and Sundays. It is advisable to contact Farnham Castle before travelling, as opening days can vary, and admission may be weather dependent. Last entry is half an hour before closing. For more information on opening dates and times call 01252 721194.